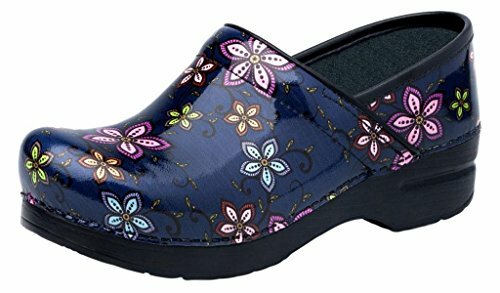 Dansko Women's Pro XP Navy Floral Patent Clog/Mule | What Should I Say? Your heel should lift up and down with every step, so if you are a half size, you may be more comfortable sizing up (for example, if you are a US 7.5, you may be more comfortable in an EU size 38). Please click here to learn about the benefits of the Pro XP. The Professional XP clog from Dansko® provides style and comfort to those in the nursing, hospitality and other occupational fields. Available in a variety of leather uppers with smooth clean finishes and natural irregularities removed. Easy to maintain and can be wiped clean with soap and water. Generously padded collar. Thermoplastic toe box provides durable reinforcement and protection while allowing toes to move comfortably. Non-allergenic leather-lined synthetic foam footbed absorbs and evaporates perspiration. PU heel allows the heel to move up and down when walking and lateral stability. PVC inner frame provides stability and reduces torque and pronation. PU outsole provides shock absorption and flexibility, withstands surfaces of extreme heat and cold. Rocker bottom propels the foot forward when walking. Slip-resistant in environments where excesses vegetable oils and animal fats are present. Slip-resistant tests carried out by SATRA, the world's leading research and technology organization for the footwear industry. Carries the Seal of Acceptance from the American Podiatric Medical Association. Dansko Footwear Size Chart Measurements: Heel Height: 1 1⁄2 in Weight: 14 oz Platform Height: 3⁄4 in Product measurements were taken using size 38 (US Women's 7.5-8), width Regular. Please note that measurements may vary by size. The Professional XP clog from Dansko® provides style and comfort to those in the nursing, hospitality and other occupational fields.